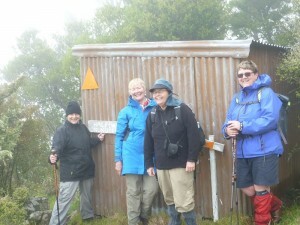 A 4-6 hour walk from 200m to 699m and back down to sea level is the first day of walking on the Banks Peninsula Track. It is a misty day – so not too hot for walking, but the views are not so expansive over Akaroa harbour, though the cloud lifts enough to see out to the Akaroa Harbour entrance. 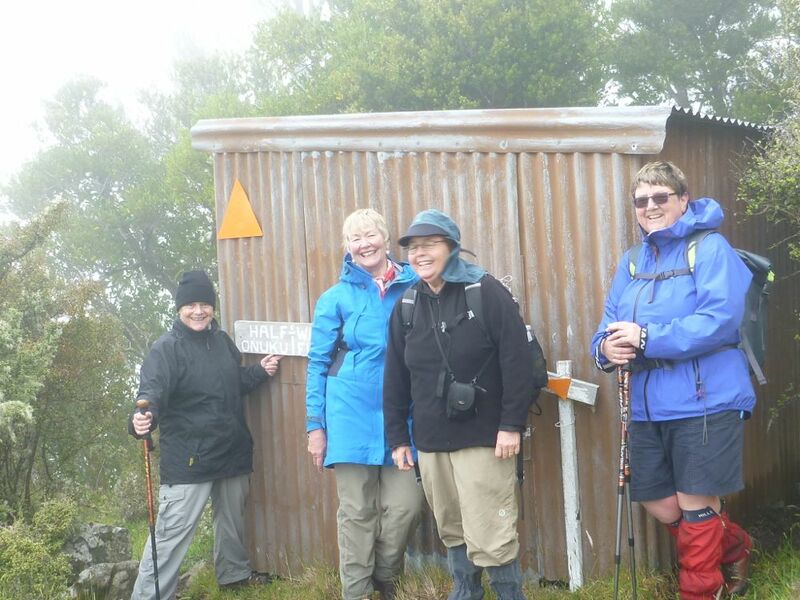 A lunch shelter at the top of the ridge provides shelter and a gathering point for both the walkers and the latte ladies carrying the bags. Then it is down to Flea Bay and our second night’s stay. This is the kind of place you can imagine not finding out about 9/11 for several years. Remote and beautiful with abundant sea life. A successful marine reserve has been established and we see dozens of seals lazily patrolling the edges of the bay. Schools of fish attract the seabirds who duck and dive to feed. This has been a working farm since 1843 when the Rhodes family arrived to live as the first white residents. Francis and Sheree Helps have been here since the late 1960s. 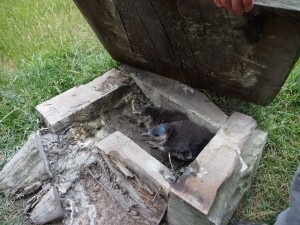 and the farm has moved focus from raising sheep, to raising penguins – the white flippered little blue penguins or Korora in Maori. There are now more penguins than sheep – the largest little penguin colony on mainland New Zealand. 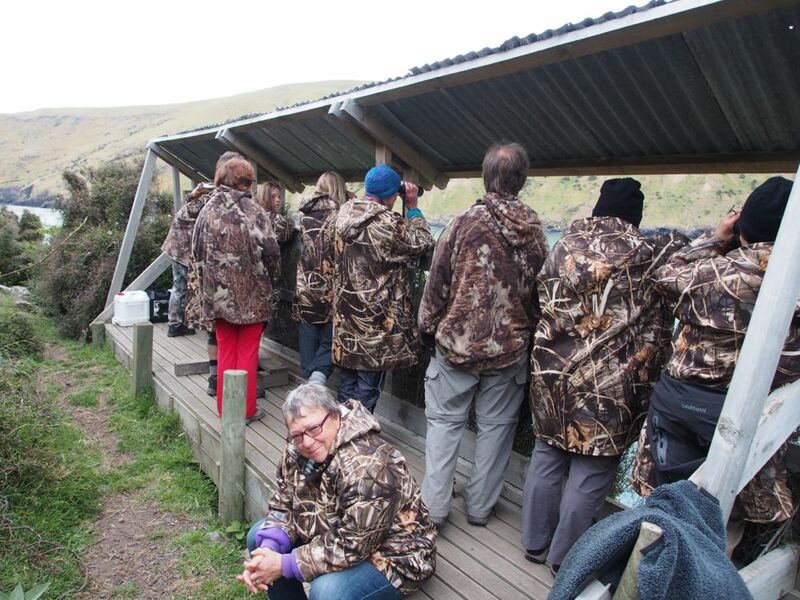 At 7.45pm each night there is a penguin tour, and we walk out to the headland to watch the penguins coming home to feed the last of the young ones. We gently pick up a couple of roof tops on their dwellings to see baby penguins awaiting their parent’s return. The little penguins nest about 10m from each other, and spread out over the paddock are little penguin homes – mostly made by Sheree. The penguins are not too proud to use a shelter built by someone else – as long as it is dry and dark. Intensive trapping have made this a safe environment for penguins and their population is steadily increasing. There are even some yellow eyed penguins, though they struggle more as a population. Day two of the walk is a fairly easy day, and the option of sea kayaking is on offer at 8.30 each morning. Unfortunately we wake to a cold rainy day, so today kayaking is not very tempting.